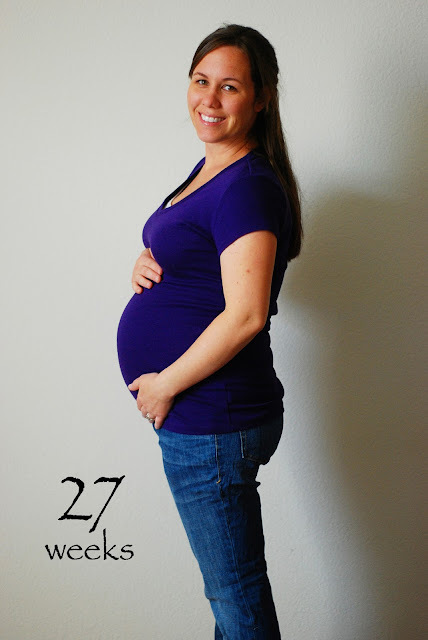 27 weeks pregnant today with baby boy. I'm about 95% sure that we know his name, and it's not going to be a secret, but I'm not going to post it here until I know for sure. Something about it...I don't know....I just can't commit 100%. I think boy names are so much harder to pick out than girls. Do you? Of course, this is our only time to figure out a boy name so I have no thing to compare it to...but this has been my experience thus far! Feeling good though. Since my last update about having some PVCs (premature ventricular contractions) where my heart would skip beats and such....I have not had any! Such a praise. They were just so uncomfortable and I could tell after I didn't have them anymore that I had more energy. So very thankful for this. Sleeping: Mostly good. I usually wake up once to use the restroom and if its after 5am theres a pretty good chance that I won't go back to sleep. I lay there for a while then usually just get up early and try to get some stuff done before the girls wake up. I'm feeling him move so much these days. Last night Geoff and I were sitting on the couch and he had scrunched himself way over to my right side. It was kind of funny (and uncomfortable!) because we could total squish my left side because nothing was there....but my ride side was hard as a rock and was lop-sided. Today (or at least right now)....he's sprawled out all over my belly. I have almost all of the fabric I need to start on his bedding and curtains....we have almost all the paint for his walls....and we'll hopefully get some of these things done this week. Ready to cross things off of my ever expanding list! This is me 27 weeks with Grace. I can't decide if I look bigger this time or what? Maybe a little rounder. Ha! I don't think you look bigger at all than you did with Grace(or Parker). It's just so exciting. So thankful you aren't having that problem still. Cannot wait to meet my new great-nephew! God Bless! I was wondering if you got bigger quicker with this one, but looking at the pictures it does look almost the same but yeah maybe how he is in your belly it looks a different shape!